A list of all known digital bootlegs in circulation. World of Music, Arts and Dance— To bring together and to celebrate many forms of music, arts and dance drawn from countries and cultures all over the world. I hope I get to go to one of these one day. Bay Area-based marimba band playing high-energy dance music and polyrhythmic trance music from Zimbabwe, from traditional to contemporary. Celebrating the musical cultures of Africa and the African Diaspora. Building a worldwide network of African artists who perform in venues worldwide. Valuable resource for learning about African music. Guide to dating your U.S. made stringed intrument. Purchace directly from the source. Comprehensive list of African radio stations on the Internet, updated by SULAIR. The name says it all. From Gabon via Paris and now broadcast over the Internet. Always on, but really swings late nights. Mondays, 7pm  8 pm on KPFA 94.1 FM, San Francisco. A weekly news program providing information and analysis about Africa and the African Diaspora. Info on these great recordings. The online resource dedicated to Jerry Garcia’s non-Grateful Dead work. 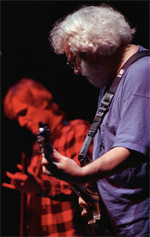 FTP access to download numerous high quality and classic Grateful Dead, JGB and other gems. From Alan Hertz to Zero; you name the date and you get the set list. Offline. A shn file distribution site for live jam bands mus. This group is dedicated to trading and vining legal recordings of live music especially the Grateful Dead and related discussion.